Hi, I got the same thing! Totally disappointing! Topic: Address for: "Call of the Wild"
Address for: "Call of the Wild"
I sent to the College address. Apparently my letter and photos were forwarded to the Supreme Court. I received a reply from the Supreme Court that she is retired and not signing. I wonder if there's another way to reach her that's not the Supreme Court or the College of William and Marry address? Does anyone have the local production office for the Pale Blue Dot? 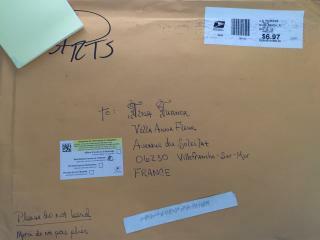 Hello, I wrote to the Tina Turner address in France and received my mail back (return to sender). Does anyone have the mailing address for LITTLE WOMEN (it may be in production soon). Thanks.